LET'S TALK TURKEY....A follow-up post about soaking a turkey can be summed up in one word - SUCCESS! My husband soaked the turkey, using a turkey brine recipe, before roasting it for the very first time. The turkey brine was beautiful (sounds weird I know...but look back at my previous post to see for yourself) and made our home smell wonderful! The probing question is...how did the turkey look and taste? First of all....I don't think I mentioned in my earlier post that my husband also changed something else this year. We bought one of those big roasting pans that you cover and plug into the wall outlet. Would you say we were exceptionally brave this year??? - soaking the turkey for the first time and changing the cooking pan involved in roasting the bird? The surprise of it all was how long it took to roast the 21.5 pound bird - under 2 hours. That was quick wasn't it? In fact we just did not believe it until we checked the internal temperature using a meat thermometer to discover that it had reached the 160 degrees F in the thickest part of the breast. Now some words about the turkey's appearance. It was not that pretty. My husband always prides himself...not only on the taste of a turkey but the appearance. He rubbed the outside of this turkey with the usual herbs, spices and butter. The turkey was not as pretty as most of our past turkeys but "you can't judge a book by it's cover" right? More on that in a minute. Our conclusion is that the roasting pan/with the cover was the factor in which kept the bird from browning evenly. Finally, some comments on the taste. It was delicious and I'm not just saying that! It was probably the most moist of any other turkey we've had the privilege of cooking and devouring. We sliced it, put the meat back into the roasting pan...periodically pouring juices from the bottom of pan over the slices. The roasting pan was steadied on warm until the turkey was served. In fact...this turkey did not dry out like most turkeys would under these circumstances. We believe the turkey brine/soaking method sealed the moisture in for good. To sum things up....The turkey brine and new roasting pan were a SUCCESS or should I say...Cooking our 2010 Thanksgiving turkey was a SUCCESS! If you were to ask my husband if he plans to use the same method he used this year - next time he roasts a Thanksgiving turkey --- I'm certain his answer would be YES! HOPE ALL MY BLOG FOLLOWERS HAD A WONDERFUL, BLESSED THANKSGIVING! WE HAVE SO MUCH TO BE THANKFUL FOR IN 2010! PART 1 - My husband is always in charge of the turkey each Thanksgiving. He does an awesome job every time! The turkey is always tasty and moist. He has never soaked the turkey but after watching The Thanksgiving Throwdown with The Pioneer Woman...Ree Drummond and Bobby Flay he has decided to change things up this year. 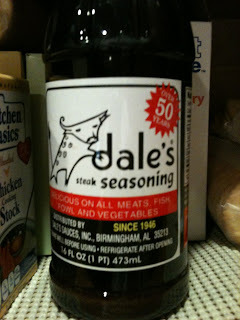 My husband made My Favorite Turkey Brine (see below) tonight and submerged the turkey. The 21.5 pound turkey is in the stock pot in the refrigerator. Watch for PART 2 - after the turkey is roasted and devoured tomorrow. uncooked turkey in brine solution, then refrigerate 16 to 24 hours. When ready to roast turkey, remove turkey from brine. Submerge turkey in a pot or sink of fresh, cold water. Allow to sit in clean water for 15 minutes to remove excess salt from the outside. Discard brine. Remove turkey from clean water, pat dry and cook according to your normal roasting method. There are some recipes that one cannot write down how to make. This is one of those recipes, but I will do my best to share it with my readers! Grandma Franklin made the most amazing stuffing balls each Thanksgiving! Sadly, she is no longer with us...but our family continues to enjoy a tradition each Thanksgiving (and Christmas). My sister and I continue to put these dressing balls on the table both holidays. A little more work is involved in making these dressing balls...but the effort is worth it. I'm certain Grandma created this recipe, because as you will notice, there are no set measurement amounts. I will share what measurements (in parentheses) work for me, but these amounts don't always stay fixed. For this particular recipe...one must taste the finished mixture and add seasonings to taste. That's what Grandma Franklin would do! Chop and saute' onion and celery (1 small onion and 4 stalks celery) in butter (1 stick) . Meanwhile, cook 1 package long grain rice according to directions. (I use Uncle Ben's Long Grain Rice). Pour 1 large bag of Herb Stuffing Mix (crushed/not cubed) into a large mixing bowl. Add onion/celery mixture and cooked rice. Add celery salt (1 tsp) and sage (1 teaspoon/sometimes a little more) to taste. Add 2 chopped hard boiled eggs (chopped fine). Add turkey or chicken broth (I usually add 2-3 cans chicken broth). *You want your mixture to be very moist. Add salt and pepper to taste. Optional - add chopped turkey or chicken. Mix well. Roll into small balls and place in baking pan. Cook approximately 30 minutes on 350 degrees F. Watch closely. You want the dressing balls to be slightly browned. I doubled the recipe...that's why you see two sticks of butter. Melt butter in a non-stick pan. Chop onion and celery...using a really good chopper. I have a Pampered Chef chopper...really good one! Use the crushed herb stuffing mix. It adds the flavor you need! Chopped eggs using that really good chopper. My daughter and I participated in the annual local Craft & Gift Fair. We had so much fun and both agreed it was a successful first event for both of us. I have discovered some really great kid's cookbooks lately! It has been a joy making some of the recipes within them! I'm actually starting a collection of kid's cookbooks for my grandchildren. My grandson shows a real interest in cooking so we look forward to getting in the kitchen with him more. No doubt, my granddaughter will be right in the middle (of the kitchen). The recipe my husband and I made tonight comes from Williams-Sonoma Fun Food. I believe this dish will be made over and over in our household, therefore memorized! We served it with french bread and dipping oil! The subtitle says...25 Delicious Recipes That Kids Can Cook. I believe that should say...25 Delicious Recipes That Kids Can Cook and Adults Will Enjoy! By the way...the pictures and detailed directions included within this cookbook are outstanding! Chop garlic cloves and parsley. Add the chopped garlic and red pepper flakes to a saute pan with olive oil. Cook, stirring frequently, until the garlic is just beginning to turn golden (3-4 minutes). hey are softened and juicy. Add tomatoes and continue cooking until softened and juicy. Remove from heat. Cook pasta according to package directions, using the salt. Drain. Place the saute pan back on stove, adding the lemon zest and parsley. Add angel hair pasta and toss with other ingredients. Cut salami in small strips and add to mix. Add black pepper to taste. Warm and serve with Parmesan cheese. If I were to change anything about this recipe it would be to add more tomatoes and/or tomato sauce. I will experiment next time! Source: Rosenbaum, Stephanie. Tomato & Salami Angel Hair Pasta. 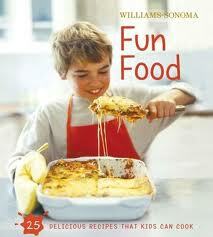 Williams-Sonoma Fun Food. Free Press, 2006. 59-63. It's hunting season and my son is a huge duck hunter....you might say he is a little obsessed. Tonight my husband made us fish that my son caught (it's fishing season too) ...last week my son made his wife, son and father Duck Jalapeno Wraps. Did you notice that I wasn't mentioned in the mix? I'm not a fan of duck. My husband and grandson said they were good. Butterfly duck breasts. Marinade and tenderize. Add some cream cheese chunks and 2 jalapeno slices on one half. Fold breast back over secure closed with toothpicks. Wrap with bacon and secure with toothpicks. ﻿Grill over medium-low heat until the bacon is done. Best when cooked medium to medium well.